Shopkeeper Solutions have teamed up with POSeCOM for on-line store integration with The Jewellery Shopkeeper. 2019 will see Shopkeeper Solutions new online shop using the standard JSK API that we have developed over the past years. All inventory groups, descriptions, photo images, prices and availability are automatically propogated to the online website. The way it works is truly exciting.. 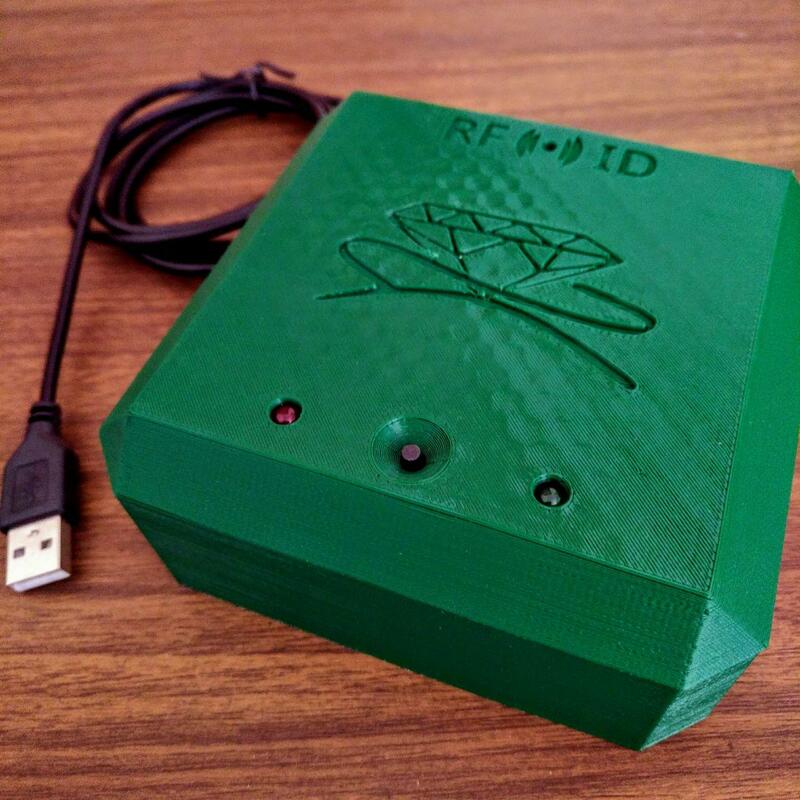 Here's our desktop UHF RFID reader. Simply plug it into the nearest USB socket. One button to activate. Intended mainly for linking RFID tags to JSK inventory in back-office, it will also work as a point-of-sale tag reader. We are excited to leak the news that Shopkeeper Solutions are in advanced stages of developing a custom system for RFID inventory control. This development that is complete is mostly in the software which we is already being 'teased' in the Stock-take Import menu. The system will work with a variety of commercial HF and UHF RFID readers and tags, but for ease of use and best experience we are developing special readers and tags. We have a successful prototype HF scanner already being used for our in-house testing. The HF RFID technology is most commonly referred to as NFC instead of RFID. It works by electro-magnetic induction to a coil in the passive tag. This induced electricity powers a tiny electronic chip witch then transmits a response that the reader detects. Although the range is just a few centimeters it is quicker and easier to read than bar-coded jewellery labels because the tags do not need to be positioned exactly but instead can even be hidden behind display material. HF readers also cost less than UHF readers at the present time. UHF tags use propagated radio waves. The tags work with electronic chips that are similar in function to the chips that are in the NFC tags, but they are powered with a antenna rather than a coil. The sensitivity of the antenna, and thus the reading distance, is relative to its size. This has been the problem with the adoption of RFID in the jewellery retail business. Three things that are bad: 1) High cost of software, readers and tags. 2) Short and unreliable read range, compounded by the fact that the tags get masked by nearby radio-conductive objects. and 3) Software that is not easy to use. We are working to solve all three of the bad features just mentioned. 1+2) We will include all software required as part of The Jewellery Shopkeeper at no extra cost. We are designing re-usable RFID tags that are optimized for longer read range while being good looking. Re-usability changes the RFID tag cost from an expense to an asset. An average jewellery shop can buy a few thousand tags once-off and they will last for many years - only the secure nylon ties will need to be replaced each time the tag is allocated to a new item. Finally, we are working hard to develop a UHF scanner that might be half the price of other scanners currently on the market. and 3) Our software is really easy to use and friendly provided that it is used with a compatible scanner. If you are in Port Elizabeth we will gladly give you a demonstration. For the future, I foresee commercial scanner prices coming down as the market matures, but will they work as expected? Will they be easy to use? Our in-house developed UHF wireless scanners will be ready for testing within just a few weeks. We are looking for beta test sites. If you are interested in putting our RFID system to the test please let us know. Currently our production capability for RFID tags is only a bit over 300 per month, so you will need to wait a while for tags. Obviously, once the beta test phase is successfully completed, we will tool up to increase production. Shopkeeper Solutions now offer custom design and printing of objects. We offer a number of plastic types and colours. Size is limited only by the time that it takes to print because 3D printing a slow! Dimensional accuracy and resolution to 0.1mm. Come to us for your custom window display stands and ornaments. We will, in 2018, develop a range of stock designs for you to choose from. See details on our "Shop" page. Everything from resizing orders or watch repairs to custom make-ups or production for stock, The Jewellery Shopkeeper 'Orders' utility does it all with many security features and optional automatic reports and alerts for your clients. Security measures are mostly optional and only enabled on request, but the one thing that is enabled by default is the tracking database. The tracking database is updated with any status change and has search functions that help management. SMS and/or email notifications are pre-programmed for job quotations as well as notifications that jobs are ready. All notifications are also recorded in the tracking logs. Ready orders can be converted to inventory, or invoiced directly to the customer. Multiple jobs, such as work that has been done for another jeweller, can be invoiced on a single invoice. It recently came to my attention that jewellers were first merchandising custom make-ups before invoicing them to the customer so that the customer would get an un-detailed invoice instead of one that showed the parts and labour as itemised parts and also to correct the final sales analysis code. To overcome this extra processing step the single-order invoice now allows one to replace the invoice sales analysis code and description while keeping price and cost for security and fully cross-referencing with the original order and tracking data. There are many 'tricks' to improve usability for all situations. Please ask us for tips to help with your particular requirements. New reports: Added merchandise & std stock Group Movement & Turn Ratio by month reports. These reports aggregate each group code and show the totals for both quantity and cost value of opening stock, replenishments, sales and closing stock as well as the turnover ratio of each group. These reports can also be scheduled to be sent to management automatically each month. If you look at the enhancements listed in the first 2 weeks of this year you may think that I've been on holiday, but that's not the case. In fact, between 01/01/17 and 17/01/17 I have logged 9 bug fixes, 3 custom enhancements, 2 security updates and the single general enhancement. Watch 2017 for more management control from hand-held devices while on the go. Multi-currency for both appro (consignment) costing and all pricing. Local/USD/GoldDollar/PlatinumDollar/PaladiumDollar/Euro. All with fully automatic updates and transparent to the point-of-sale user. Dedicated 'Push-Back' utility for goods returned to supplier, wit follow-up tracking. Added, on request, automatic scheduled reports for sales, service orders, appros and GRVs. Including image catalogues. Allowed point-of-sale staff, with no access to other confidential data, ability to add new stock and report history of their own prior goods receiving transactions. Added image add in web data displayer. Allows adding inventory images to your Shopkeeper database with nothing but a smartphone! Plus another 87 enhancements. See full list by clicking the Updates tab on the left. I have created a Telegram group called 'Jeweller Tech Talk'. The idea being that people can ask questions, make comments, complain, give hints and almost anything else. Please keep it related to the jewellery industry. But also be fully aware that ANYONE can read the messages, so keep your trade secrets off the group! No matter what software you use, the group is open to all. Pastel, Accpac, Omni, Quickbooks, Ethos, Jeweltech, JSK or the good old reliable hard-cover ledgers -- everyone. Let's share our knowledge and experience using different tools and methods for accounting, inventory control, CRM, etc. The messaging platform we use is Telegram Messaging. It is a relatively new instant messaging program that is likely to become the most popular IM app in the future. I highly recommend it for a number of reasons. Join the group by clicking on this link. New optional automatic reports include "Picture catalogue of items sold", "Consignment Items Used or Sold" and "Appro out by customer". Also, we customise the detailed sales reports as required. For example; we can add the discount percentage on each sale, the dates the items were stocked and the reports can be filtered for group range. Just ask. We are currently doing these reports and customizations as a free service! JSK can automatically send email or SMS alerts or reports either at scheduled times or triggered by data. Each report can be sent to different addresses, as required. Hundreds of automatic reports are possible. Just think of what you would like to get, and when you'd like to get it, as well as the addresses (or cell-phone numbers) to where they must be sent, and then ask for it in an email to norman@shoso.co.za. If I can make it happen, I will, and there will not be any charge for the service. PutPic is an essential add-on and is included as part of The Shopkeeper Plus. Whether your server is located on premises or in the cloud, PicPic provides reliable and securely encrypted file transfer for images and other data. But not only that -- it also has built-in intelligence to know where the put the images and data after first offering you various image enhancing functions. Take photos directly from a web cam or get photos from a digital camera or disk file. Rotate, crop, brightness, gamma and contrast. Cropping proportions can be freehand or restricted to square or 4:3 rectangle. Enlarged preview to quickly check results of the image edits. Intelligently normalise codes entered in short-hand or scanned from long bar-codes. Record merchandise, standard stock as unique inventory images or as supplier images. Supplier image is automatically used if no unique image is recorded. Quickly and easily copy an image from one code to another, or enhance an existing image. Image files are automatically resized before saving to optimize storage space and speed. Three image sizes are offered, with 320-pixel being recommended for inventory with typical detail. Useful for sending stock codes captured by a hand-held stock-take scanner to the server. Also for transferring inventory graft files that were received by email from your supplier of from an associated company. Easily browse for the file to send. The file is checked for file type and whether the file already exists on the server. If it exists it also tells you whether you have permission to overwrite the file. Secure recording of images and other data to prevent others from changing the files. If an attempt is made to overwrite a file that was recorded by another user, PutPic shows who the owner is. The file owner's password will allow the overwrite to take place. Click here for some example screen shots of The Jewellery Shopkeeper in action. Shopkeeper Solutions can provide faster, better and cheaper support to customers who choose to let us host their data on the cloud, Cloud-based servers are reliable and fast. And takes up zero floor space. No worries about hardware maintenance, uninterruptible power supply, Internet bandwidth and availability. And, your virtual server has its own static IP address to ensure 100% normal uptime by not requiring dynamic DNS services. Furthermore you can rest assured that your data is safe from fire and theft. We make record of changes four times per day to our own backup servers and keep these incremental changes for 13 months.